Shopping for Horror: Texas Chainsaw Massacre Action Figures? 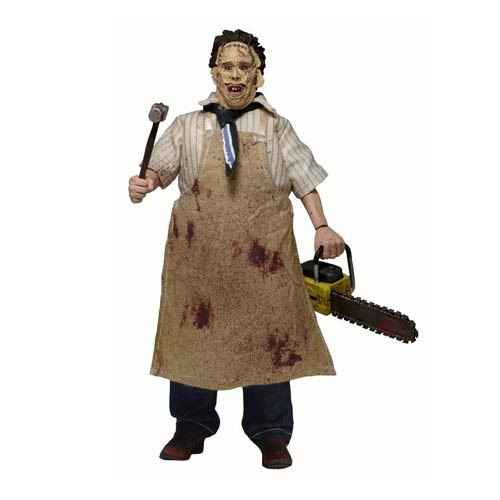 Get your retro fix with this fantastic version of Leatherface in his classic outfit from the original 1974 The Texas Chainsaw Massacre film! This poseable 8-inch articulated figure is dressed in tailored fabric clothing similar to the retro toy lines that helped define the licensed action figure market in the 1970s. Leatherface is wearing his button-down shirt, necktie, jeans, boots and apron. He comes complete with his trusty chainsaw and mallet! Blister card packaging with removable protective clamshell. Ages 17 and up.